Calvin Ooms verdient 2 WHAC uitverkiezingen! Home Calvin Ooms verdient 2 WHAC uitverkiezingen! over Calvin Ooms die zowel is uitverkozen voor het WHAC All-Conference Second Team en het WHAC All-Freshman Team. 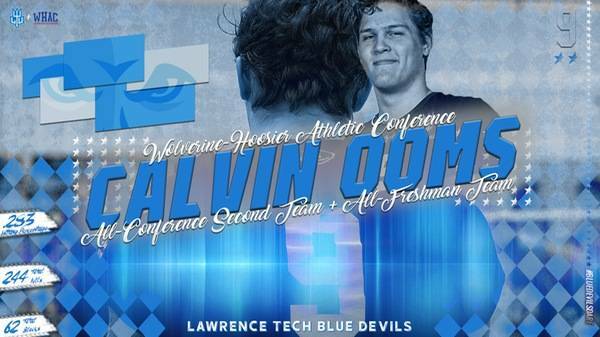 SOUTHFIELD, Mich. — Calvin Ooms of the Lawrence Technological (Mich.) University men’s volleyball team earned WHAC All-Conference Second Team honors for his work on the court this season. Ooms was also named to the WHAC All-Freshmen Team, becoming the first Blue Devil to earn all-conference and all-freshman honors. Ooms led the team in kills per set (2.6), total kills (244), digs per set (1.81), total digs (170), and hitting percentage (.283). He was secod on the team in blocks per set at 0.66. He ranks 44th in the NAIA in totals kills and kills per game. Jacob Paige, Joshua Eckert, and Joseph Balanda all earned WHAC All-Academic Honors. To earn that honor, the student-athlete must be a junior or senior with at least a 3.25 GPA. Paige also earned Champions of Character Player. Lourdes (Ohio) University and Aquinas (Mich.) College led the way with four and three first team all-conference athletes while Jeff Lam from Lourdes was named Player of the Year. 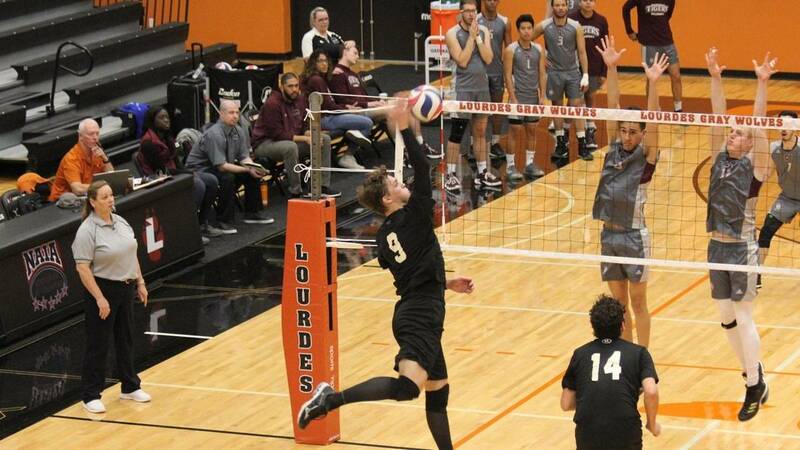 Henrique Gehrke of the Gray Wolves was named Setter of the Year and Emilier De Jesus of Siena Heights (Mich.) University was named Libero of the Year. Joshua Boothroyd of Aquinas was named Newcomer of the Year while Greg Reitz of Lourdes earned Coach of the Year. The Blue Devils are back on the court Friday, April 5 when they face top-seeded Lourdes at 7 p.m. in the WHAC Tournament Semifinals.